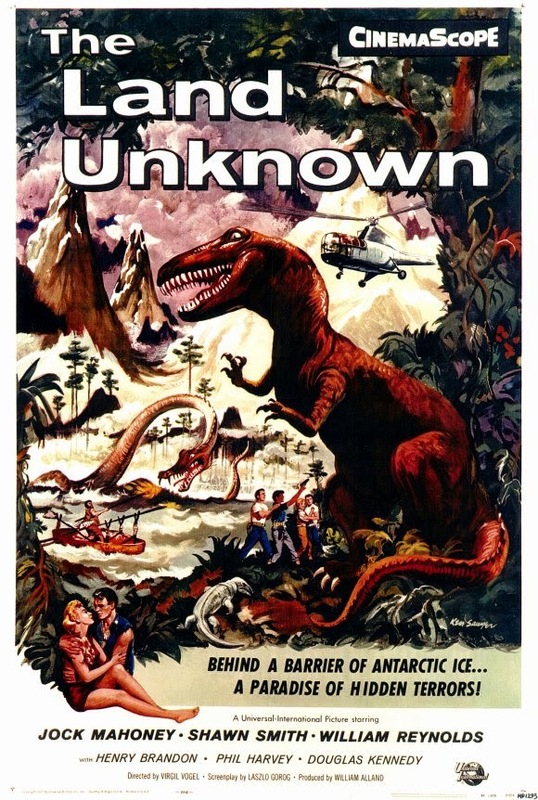 Tag line: " Lost and Terrorized in Prehistoric Time"
The Land Unknown, a 1957 “Lost World”-style fantasy / adventure, was originally going to be a big-budget extravaganza. With Jack Arnold (Creature from the Black Lagoon, Tarantula) set to direct, the plan was to shoot the movie in color with an all-star cast. Unfortunately, the dinosaurs (one of which was mechanical) cost so much money that Universal had to cut the budget in other places; color was replaced with black and white, and B-list actors were cast in the key roles. Because of these changes, Jack Arnold stepped aside, clearing the way for Virgil Vogel to take the reins. A U.S. Navy Expedition is sent to Antarctica to investigate a patch of warm water, which, according to reports, exists in the otherwise icy region. While patrolling the area in a helicopter, Commander Harold Roberts (Jock Mahoney); Lt. Jack Carmen (William Reynolds); mechanic Steve Miller (Phil Harvey); and reporter Margaret Hathaway (Shirley Patterson) are forced to fly through a storm. As a result, their helicopter is damaged in mid-flight, causing it to crash land in a tropical valley, situated hundreds of feet below sea level. To the group’s amazement, this valley is populated by a variety of dinosaurs, long thought to be extinct, and one human: Dr. Carl Hunter (Henry Brandon), sole survivor of a plane crash that occurred during Admiral Byrd’s 1947 Antarctic expedition. Hunter believes he has the equipment needed to repair the group’s damaged helicopter, but will only help if they agree to leave Margaret behind with him! While it does have its flaws, The Land Unknown, even without all the bells and whistles, is a mildly successful film. The cast does a fine job, and there are moments that really stand out (the scene where the main characters inadvertently discover the “Lost World” is handled wonderfully). I also liked how the film incorporated stock footage of Byrd’s ‘47 expedition, which added a sense of realism. The problem is the dinosaurs. Ranging from a guy in a suit (the T-Rex) to a mechanical sea monster (I’m guessing this is the one that cost so much money), these creatures, even by 1950s standards, are pretty poor (sadly, the expensive sea monster is the worst of the bunch, moving, at all times, in a way that makes it look 100% motorized). As I said, The Land Unknown is far from a terrible movie, yet I can’t help but feel a little depressed when I think of what it could have been. Is this the film where, at the very last moment, a giant gorilla inexplicably emerges from the jungle and begins attacking a T-rex menacing the heroic crew?